Two things New York City does like few others: pizza and bagels. There’s already plenty of the former in Zwift. The latter is a homage to the boiled dough that wears a thick coat of poppy seeds, sesame seeds, onion flakes, garlic flakes, pretzel salt, and pepper. Never toasted, it usually contains a schmear of cream cheese. 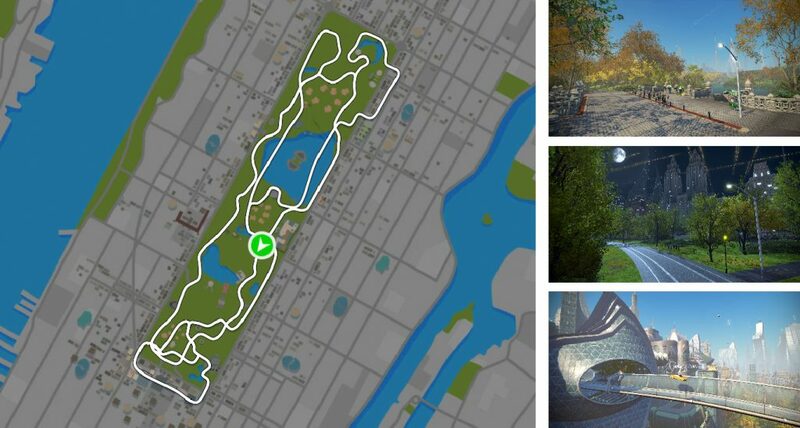 Ride the Everything Bagel and you’ll get just about everything Central Park has to offer like the sprint and KOM in both directions as well as plenty of climbing. Overlooking the lake in Central Park, the Bethesda Terrace has two levels united by two grand staircases. Majestic and timeless, you might recognize it from the big screen: scenes from The Avengers, Home Alone 2, and Enchanted were all filmed here. Come here any day of the week and you’ll probably see couples shooting their wedding photos because it’s such a romantic location. Built between 1859 and 1864, the Bethesda Terrace is also home of the Bethesda Fountain and the Angel of the Waters statue on the lower terrace. Angel of the waters is named after a story in the Gospel of John about an angel blessing a pool, giving it healing powers. Emma Stebbins finished the bronze, eight-foot statue in 1873. She was the first woman to receive a public commission for a major artwork in New York City. Yellow cabs are as New York as pizza by the slice, street hot dogs, and the Yankees. Now there’s a new NY-only experience on Zwift. Currently closed for construction IRL, you can get a good look at the Belvedere Castle on Zwift. Co-designer of Central Park, Calvert Vaux, first imagined the castle in 1869. Located on Vista Rock — the Park’s second-highest natural elevation — it’s one of the most popular destinations in the Park because it delivers stellar views of Turtle Pond, the Great Lawn and the Ramble. The Castle has also housed the official Central Park weather station since 1919. And it was also featured in the children's television series Sesame Street in the 1970s as the home of Count von Count. Located on the southeast corner of the park, on the corner 58th and 5th, this 20-story luxury hotel first opened in 1907. The Plaza’s performance space, the Persian Room, has hosted stars like Eartha Kitt, Liza Minnelli, Marlene Dietrich, Lena Horne, and Peggy Lee. Miles Davis recorded a live album there in 1958. Featured in dozens of films like North by Northwest, Scent of a Woman, and Sleepless in Seattle, the hotel that was once owned by Donald Trump pampers its guests with a butler on every floor. There are also babysitting and concierge services as well as a shopping mall and champagne bar.